The TP-Link Smart LED Light Bulb has four different models to choose from ranging in price and feature set. They are easy to configure, fun and simple to use from the Kasa smart phone application, and controllable via scenes where you can group devices and settings for a combination effect. I have been on a personal hunt for a very long time when it comes to home automation or smart home gadgets. But rarely did I ever commit to a specific technology. I always imagined how nice it would be to incorporate a collection of devices that would respond to their surroundings or even work off a basic schedule. If that were the case I could set a schedule and automate my driveway and porch lights, living room lights, close blinds, adjust the A/C down, and maybe even turn on some music. The average person’s schedule is fairly predictable, so that means you can do some interesting things with schedules at least. For others with a less predictable schedule, it would make more sense for your home to dynamically respond to a series of triggers. This could be anything from a voice controlled home attendant to triggered events based on an action taken like flipping a switch. The home automation industry has been at it for decades catering to enthusiasts with a pension for tech and wealthy professionals willing to spend a sizable sum of cash on a fully integrated home solution. But the obvious problem with this list of customers is the missing majority of the average Joe and Susie homemaker. It would almost be easier to list what was available than to list what was lacking to make the future a reality. I believe we are finally at a point where the industry will focus on necessary integration between different vendors. A few developments are driving this trend that has been long overdue, to spur the necessary innovation required. TP-Link, more known for the network switching product line has been producing some interesting smart home devices that caught my attention. I purchased several out of sheer curiosity, and thought this would be a good opportunity for review at the same time. 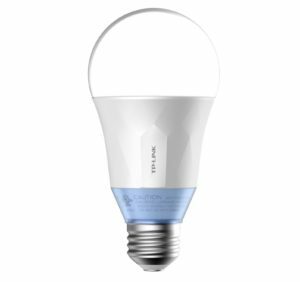 My first purchase was the TP-Link Smart LED Light Bulb, model LB120. There are currently four different models: LB100, LB110, LB120, and LB130. To get everything configured, download the Kasa smart phone application (iOS/Droid). The application itself is well designed with a clean interface that allows you to configure individual devices, and create scenes by grouping devices and actions. In addition the TP-Link home automation line is compatible with Amazon Echo/Alexa so you can tie everything together with voice commands. For example “Alexa, turn off living room lights.” Or, “Alexa, turn off lamp number one.” It’s a wonderful experience to turn off all your home lights from the bedroom, or turn on the porch light. It’s great when you can finally start making technology work for you.